The Bulletin of the Atomic Scientists today moved the hands of the symbolic Doomsday Clock to 2 Minutes to Midnight, indicating that the world is the closest to possible nuclear armageddon since the height of the Cold War in 1953. The group, which was founded in 1945 by Manhattan Project scientists, specifically notes “the decline of U.S. leadership and a related demise of diplomacy under the Trump administration” as a global concern and a reason for this year’s leap closer to midnight. Today's announcement highlights the need for nuclear risk reduction measures, such as those being advanced by U.S. Senator Ed Markey, Co-President of Parliamentarians for Nuclear Nonproliferation and Disarmament. Markey has introduced legislation into the Senate (with companion legislation in the House introduced by Ted Lieu) to restrict the authority of the U.S. President to launch a nuclear attack without first consulting congress. See Joint letter to Trump administration on reducing role of nuclear weaponsand Joint letter to the Trump administration opposing the production of new destabilizing nuclear weapons. In May 2018, the United Nations General Assembly will hold the first ever High-Level Conference on Nuclear Disarmament. In light of the increased risks of nuclear war, this conference has become even more important than when it was first proposed to the UN five years ago. World leaders participating in this event should be encouraged - and will be expected - to take action to reduce these risks and advance nuclear disarmament. Call on your government to attend the UN High-Level Conference on Nuclear Disarmament at the highest level (Prime Minister, President or Foreign Minister) and to do their best at the conference to reduce nuclear risks and advance the abolition of nuclear weapons. 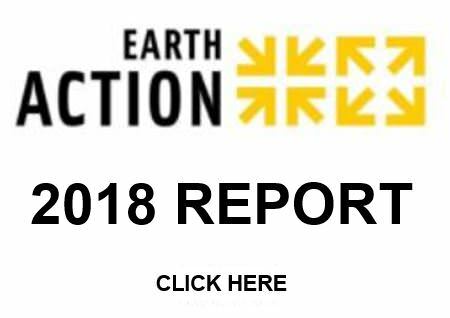 EarthAction, a global network of over 2,000 organizations in 160 countries, and Cultural Survival, an advocacy organization for Indigenous Peoples’ rights, have begun a worldwide campaign to protect the Prey Lang forest in Cambodia—its people, its trees, its life. The international campaign supports and complements the local efforts of the Prey Lang Community Network, a group of mostly Indigenous people whose villages surround the Prey Lang forest and whose livelihoods depend on the forest’s resources. Prey Lang, about the size of Rhode Island, is the last large primary forest of its kind on the Indochina peninsula. Campaigners point out that Prey Lang is to Cambodia, what the Amazon is to Brazil. A few decades ago, almost no one recognized the imminent destruction of the Amazon rainforest and its potential damage to global ecosystems. “That's where we are today with the imminent destruction of Prey Lang,” states Lois Barber, EarthAction’s Executive Director. Local and global campaigners are calling on the government to stop the threats to activists who are trying to protect the forest, even while illegal logging and clear cutting continue. An informal national alliance of grassroots groups and NGOs that includes farmers, fishers, tourist workers, vendors, and other informal workers from all across the country are standing in solidarity with the Prey Lang Network. Outrage over Prey Lang’s destruction is mobilizing opposition throughout the country in a way that few issues have. For years the Prey Lang forest has been under attack from illegal road builders and loggers, agribusiness, and mining companies who have made quick profits by extracting and exporting the forest’s natural resources. The villagers have been unable to determine where the trees are taken, but it is believed that much of the wood is illegally smuggled into China and Vietnam where it is made into cheap patio furniture and other wood products that are exported around the world. Campaigners note that messages can be sent to Cambodian Prime Minister Hun Sen, care of the Cambodian UN Mission, 327 East 58th Street, New York NY 10022 USA, Email: Cambodia@un.int. At www.earthaction.org/ourforest, people and organizations can add their name to a sign-on letter to Prime Minister Hun Sen, and request a free Prey Lang Action Kit. 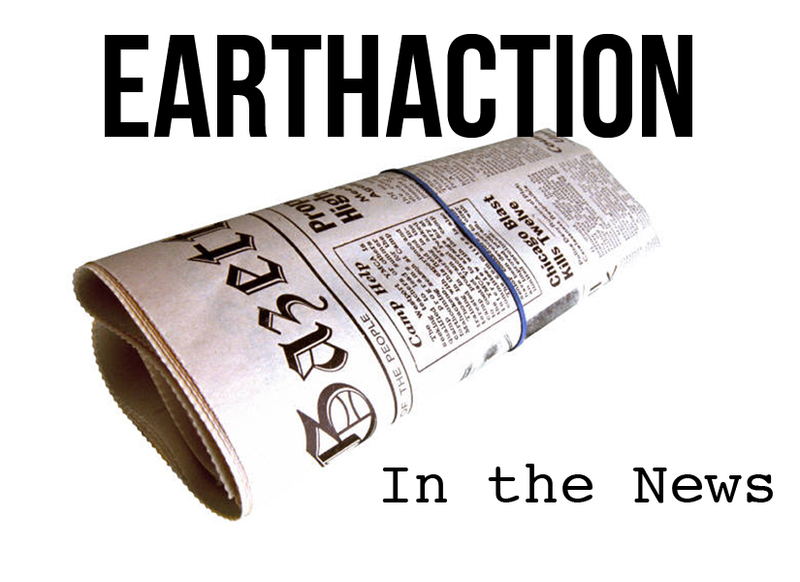 Previous campaigns organized by EarthAction in collaboration with local groups faced with the destruction of their forests have resulted in saving the Lopè Forest Reserve in Gabon, Clayoquot Sound in British Columbia, Canada (both of which are now UN Biosphere Reserves), and the Imataca Forest in Venezuela. Previous campaigns organized by Global Response with local groups have saved rainforests in Costa Rica, Venezuela, Nigeria, Honduras, Chile, and Nicaragua. About Cultural Survival. For 40 years, Cultural Survival has partnered with Indigenous Peoples around the world to protect their lands, languages and cultures. At the request of Indigenous communities that are struggling to prevent environmental destruction in their territories, the Global Response program organizes international public-pressure campaigns to change the policies and behaviors of governments and corporations. The Bigger Picture: In 1970, 70% of Cambodia’s land was covered with old-growth forests. Today it is only 3%. Cambodia has the third highest deforestation rate in the world, behind only Nigeria and Vietnam. Size: The core area of Prey Lang consists of primary, lowland, evergreen, forests, that cover about 200,000 acres. It is surrounded by over 600,000 acres of secondary forest. The entire Prey Lang area is roughly the size of Rhode Island. 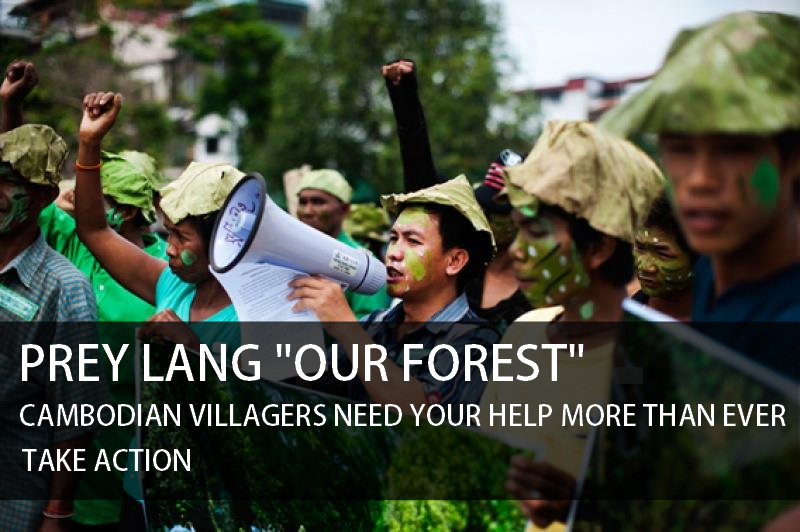 Population: 200,000 people depend on the Prey Lang forest for their livelihoods, their culture, and their lives. Some 300 villages and family rice fields are also at risk that are scattered through a large buffer zone of secondary forest that surrounds Prey Lang. Not Legally Protected: The Prey Lang forest is not fully legally protected by law, and existing laws are not enforced. Illegal loggers are clear-cutting large areas of old-growth trees. Industrial Concessions: More than 30 companies have been granted economic and mining land concessions in the greater Prey Lang area by the Cambodian government. Old-growth forests are clear-cut and replaced with rubber tree and cassava plantations (the latter to provide ‘eco-friendly’ ethanol), or mined for iron and other ores. Rate of Destruction: A botanical team from a top European University recently conducted several surveys in Prey Lang and predict that at the current rate of destruction, the entire Prey Lang forest will be gone within five years. Biodiversity: Prey Lang is Cambodia’s ‘Amazon’. The forest has seven distinct ecosystems, including primordial swamp forest, that provide habitat to more than 50 endangered animal and bird species including sun bears, tigers, and leopards. Most areas remain largely unexplored by scientists. Elephants and tigers may still roam in parts of Prey Lang. Water & Food Security: The Prey Lang forest is a vital source of water for Cambodia’s rice growing region and for the Mekong delta. As a primary watershed regulating water and sediment flow to the Tonle Sap Basin, and as an important fish spawning area, Prey Lang is vital for Cambodia’s long-term environmental sustainability and for food and water security. Climate Stabilization: Left standing, the Prey Lang forest has among the highest carbon sequestration values in the region and is a powerhouse for fighting global warming. Cambodia’s Forest Administration has identified Prey Lang as an important area for conservation, with high potential for carbon-credit financing. Meeting the Needs of Villagers: The Prey Lang forest meets the food, water, livelihood, and spiritual needs of the Kuy communities. They build their rice fields along Prey Lang’s edges and go into the forest for hunting, fishing, and gathering fruits and herbs for food and ceremonies. They tap several species of trees and collect the resin for making torches and caulking boats. Resin has become the main source of cash for many Kuy families who sell it for industrial use. Overall, the forest is the spiritual center of their lives. Short Lived Victory: In 2002, the Prey Lang people and other forest communities persuaded the government to ban logging concessions. But their victory was short-lived as the government continued to award concessions to agro-industry and mining companies, both of which clear-cut the land. Repression & violence: Police armed with AK-47s have broken up Prey Lang Network meetings and Network members are being increasingly threatened with physical harm and criminal charges.